Chosen by God to be the first King of the Israelites, King Saul began his reign in 1046 BC. His main role was to defend Israel from its many enemies and he won substantial victories over the Ammonites, Philistines and Amalekites. His reign was filled with battles, honour and loss. While his dynasty was short-lived, he made a significant mark in history. Today, Udder Delights’ managing director and head cheesemaker Saul Sullivan is thrilled to present a cheese worthy of royalty. The Udder Delights King Saul Raw Blue cheese is the first of its kind to be made in Australia. Facing some criticism and scepticism, Saul worked hard to develop Australia’s first living raw cows’ milk blue cheese approved for public consumption. This premium product is produced in limited batches each year — the first vintage, released in late-2014, was just 500 half-kilogram wheels, presented in handcrafted wooden boxes. Saul spent two years on research and development, enduring exhilarating highs and crushing lows, before the product finally gained approval from the Dairy Authority of South Australia (DASA), in June 2014. If that wasn’t enough, Saul achieved a world-first by perfecting a hand-making process which gives King Saul cheese the ability to mature for more than twice as long as other blue vein cheeses. This results in maximum taste and a cheese with complexity and richness. Saul recalls the doubt expressed my most people when he mentioned his plans for a raw blue cheese: “Everyone I spoke with told me it was impossible,” he recalls. “While these sentiments initially took the wind out of my sails, I knew deep down there had to be a way and so set about on a most intensive learning experience. One of the most special things about this extraordinary product is the non-pathogenic Hafnia Alvei bacteria which makes the cheese terroir reflective. As Saul explains: “It contains and shares the flavours of the specific region where the milk-producing cows live”. King Saul Raw Blue Cheese is available only at Udder Delights’ Cheese Cellar in Hahndorf, where you can also try the product as part of our premium cheese tasting platter. We can offer postal delivery throughout Australia, or by pickup in store. 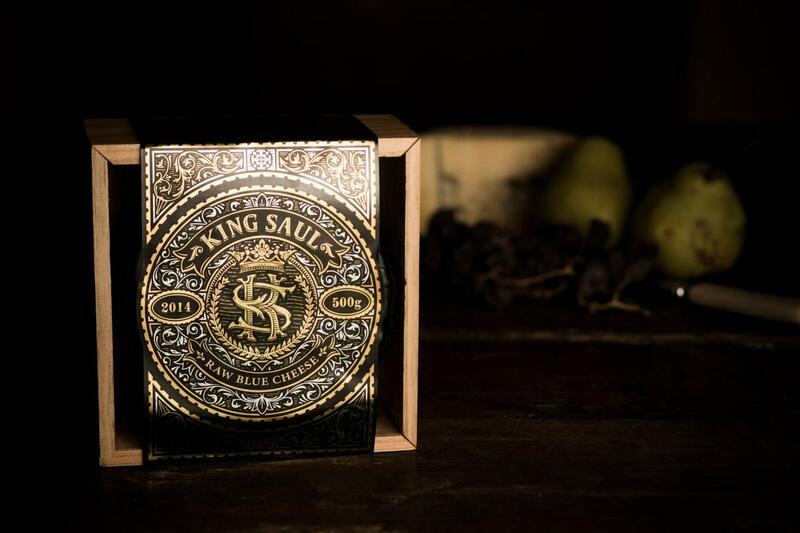 Each individually numbered and wooden box-packaged King Saul Raw Blue Cheese is $150 for a 500g round. Postage is an extra $30 and will be sent in an insulated box with ice packs.